As winter is approaching, the days are getting shorter and there are less light hours to spend outdoors. However, short days should not limit your outdoor activities. The first step towards enjoyable hiking, mountaineering or trekking in darkness is a high-quality headlamp. 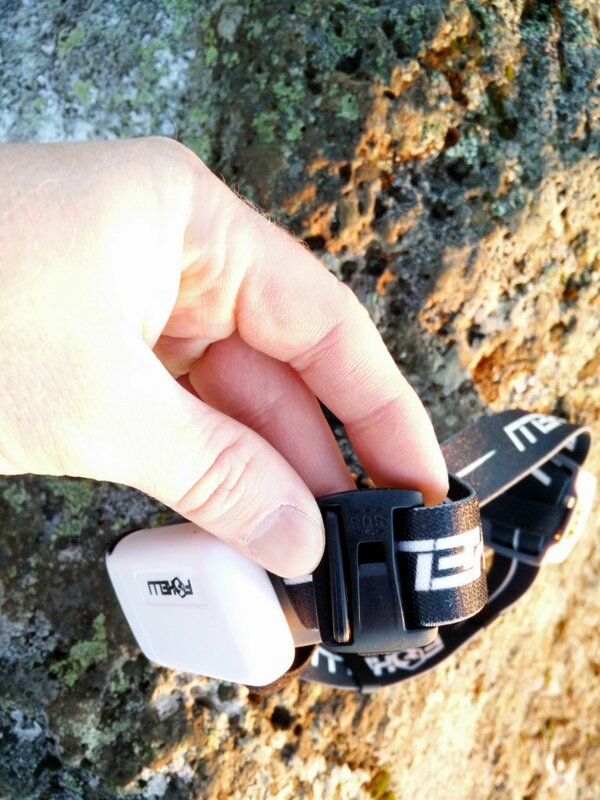 A headlamp illuminates the area around you while allowing you to use both hands. For that reason a headlamp is much more convenient to use than a casual flashlight. As you probably already know I have been on my “Hiking Iceland” tour since May 2015. In summer I really didn’t need a headlamp because the days were extremely long – up to 21 hours in June. However, this has changed now. Currently the day is no longer than 8 hours and in December the day length will decrease to only 4 hours. In these conditions it nearly impossible to go hiking without a headlamp. 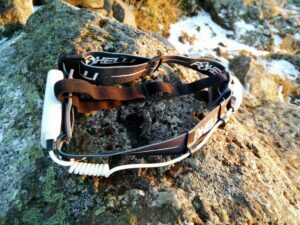 Luckily I have recently received the Foxelli Rechargeable Headlamp MX 500 and I was eager to test it. Here is what I learned. 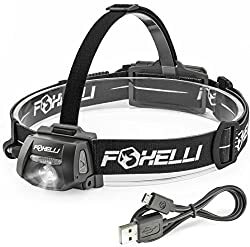 The Foxelli Rechargeable Headlamp MX 500 offers a good fit due to an easily adjustable headband and top strap. The fit is additionally improved with a great weight balance – the battery is on the backside and thus acting as a counterweight to the lamp on the forehead. The battery is connected to the lamp with a flexible cable which is attached to the headband with plastic loops. If you shave your head like me, the plastic loops can be a little uncomfortable if you are not wearing the headlamp over a hat as they go around the headband and are not flexible. However, when wearing the headlamp over a hat I haven’t noticed any discomfort. The lamp can be vertically adjusted in five steps and is fairly light – it weighs 130 grams. The headlamp offers 5 different modes – minimum, average, maximum, ultra bright and SOS (visual distress signal). You switch between these modes as well as turn the light on and off with a single push button which is located on the left side of the headlamp. When pressing the button once you enter the average mode; twice the maximum mode; three times the minimum mode and four times the ultra bright mode. The ultra bright mode automatically switches to the average mode after 3 minutes to reduce the battery consumption. As not to send out a distress signal accidentally, it takes a bit more to enter the SOS mode – you have to push the button for approximately 1.5 seconds. The headlamp offers the brightness of 280 lumens in ultra bright mode, 200 lumens in maximum mode, 95 lumens in average mode and 12 lumens in minimum mode. With the adjustable lens you can switch between a focused and a wide beam. Additionally the headlamp has a green led diode on the battery (backside) which turns on automatically when the headlamp is on – thus making you visible to other people behind you. 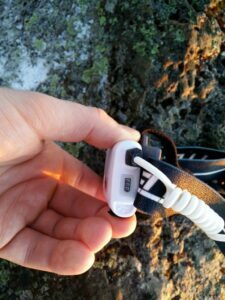 I tested the brightness of the headlamp while descending Mount Esja in the night. The headlamp provided sufficient brightness to feel comfortable on the trail in average mode with wide beam. Maximum and ultra bright modes give the best results with a focused beam – they effectively illuminate the area up to 100 meter ahead. Minimum mode doesn’t provide the sufficient illumination for hiking but can come in handy for around-the-camp use. The Foxelli MX 500 comes with a rechargeable 1800 mAh Polymer battery. The battery can be recharged with a USB cable – it has Micro USB plug and the cable comes included with the product. The maximum battery life is 100 hours in the minimum mode. 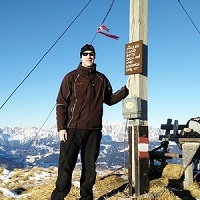 But while hiking you will probably use the average mode in which the battery lasts for approximately 14 hours. In the maximum mode the battery lasts for 8 hours which is a good result taking into account that the headlamp produces 200 lumens of brightness in this mode. While it is great that you can charge the battery in a cheap manner, it is still a downside that the headlamp can’t run on standard batteries too. This means that you will have to find a source of electricity if the battery drains completely – rather than simply inserting a couple of AAA batteries until you can charge the normal battery again. A good feature of the headlamp is that there is a battery level indicator on the bottom of the headlamp which turns red when the battery is running out. The headlamp is fairly robust and meets the IPX7 standard. This means that it withstands exposure to water of up to 1 meter for up to 30 minutes. Additionally the headlamp is made out of materials which provide great durability. Note: I haven’t tested the waterproofness of the headlamp. I tested the headlamp while descending Mount Esja in the night. 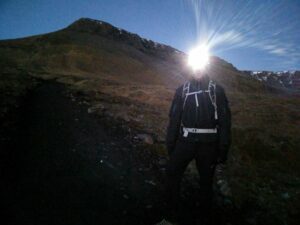 The headlamp stayed firmly on my head and I didn’t notice any discomfort. The brightness provided in average mode (wide beam) was sufficient for the descent, but I was also testing the maximum and ultra bright mode. Here I was really surprised over the illumination provided – especially when using the narrow beam. After 2 hours of use there was no sign of decreased power even though it was quite cold and windy (battery life time is in general decreased in cold environment). After that I used the headlamp several times on my running trainings and noticed that the headlamp is a bit heavy for running. However, I believe that most recreational runners won’t find it uncomfortable or bulky. As some of my running trainings took place in rainy weather, I can confirm that the headlamp is water-resistant. 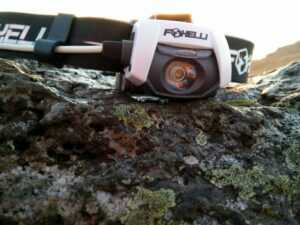 All things considered, the Foxelli MX 500 is a great rechargeable headlamp for the price. I would recommend it to hikers, trekkers and mountaineers who need a durable and powerful headlamp for their adventures. Hiking Backpacks Guide – How to choose the right backpack?